﻿ Edin Dzeko: "Any team that has Cristiano Ronaldo is favorite to win"
16.10.2011 » Edin Dzeko: "Any team that has Cristiano Ronaldo is favorite to win"
Portugal and Bosnia-Herzegovina will dispute one of the last tickets for the EURO 2012. The draw was made this last Thursday and it didn't take long for some of the players who will be involved in this game to react. Edin Dzeko, from Manchester City, pointed out that any team that can count with Cristiano Ronaldo, is always a favorite. Manchester City striker, Edin Dzeko, made a first preview on the upcoming 2-leg playoff that Bosnia-Herzegovina will dispute with Portugal, in order to decide who will be in next summer's EURO 2012. Dzeko is a confessed admirer of Cristiano Ronaldo and was keen to stress that wherever the Portuguese star plays, he turns that team into a favorite for any match. Edin Dzeko: "We didn't have luck, but at least now we have a chance to revenge that last playoff we've played against Portugal, for the World Cup 2010. Any team that can count with Cristiano Ronaldo is favorite, but we've already showed in the qualification stage that we're able to create troubles to the best teams. We weren't lucky in the game we played in France, but maybe	our ticket for the EURO 2012 is waiting in Portugal...". But Dzeko, who is 1,93m tall, wasn't the only Bosnian player to anticipate a tough game against Portugal. Emir Spahic, the Bosnia-Herzegovina team captain, currently plays for Sevilla, so he's also very well qualified to assess Cristiano Ronaldo quality. Nevertheless, Spahic believes that his National Team also possesses players of very high caliber and made a point based on his beliefs that Edin Dzeko can actually be compared to Cristiano Ronaldo. Spahic was quoted by UEFA.com, making the following remarks: "We wanted to play against the Czech Republic or the Republic of Ireland and I personally wanted to avoid Portugal at all costs. We'll play the first game of this playoff at home and that's actually a disadvantage. Portugal is favorite to go through, but we have a team that is able to put on a good fight against any opponent. We are a small country, but we are able to play football in world class standards. We have outstanding players and therefore, why not believing we can make a surprise? 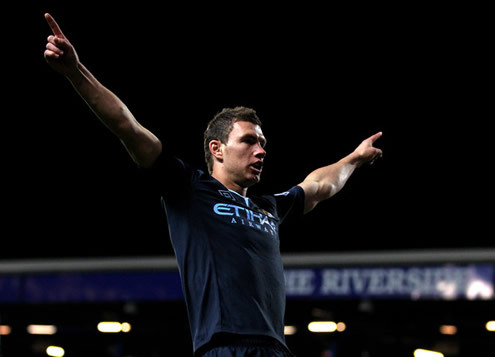 They may have Cristiano Ronaldo, but we have Edin Dzeko. ", pointed out the Sevilla player as a way of noting that his side is confident about pulling off a good result. Cristiano Ronaldo and Real Madrid will now focus in the UEFA Champions League, as they will face Lyon next Tuesday. You can watch Juventus live stream, Real Madrid vs Olympique Lyon live stream this Tuesday, in our Football Live Streams section. The countdown clock timer, displaying the time left for the next Ronaldo game, is shown on the top right corner of all pages. Besides Real Madrid game, you can also follow Otelul Galati vs Manchester United online on Tuesday, and Barcelona vs Viktoria Plzen streaming on Wednesday. All streamings are provided from our "Live" section. Below you may watch a couple photos from the Portuguese players celebrations after beating Bosnia-Herzgovina in the 2010 playoffs for the South Africa World Cup 2010.